Are you sick of the mental battle around food and sugar? Do you find yourself stuck in a vicious cycle of binge-guilt-shame when it comes to dessert? Have you decided that your life and health will change once you cut out sugar? But, you can't seem to stay away from sweets long term? Are you confused by all the conflicting dietary advice out there? Are you tired of stressing about food? Join me as we go on a compassionate journey to radically change the way you see food and sugar! I’ve been there. I grew up on sugar, and then used it as comfort food as an adult. Stressed out? Grab the ice cream. Celebrating? Let’s bake cookies! Birthday? Party? Holiday? Survive the day with kids at home? Eat all the sugar! It became so ingrained into my daily life that I didn’t even notice it anymore. Then I got sick, and started down the road of natural healing. Of course, all of those paths lead back to diet, nutrition, and cutting out SUGAR. I would try and fail so many times. I would feel gross, decide this was the “last time”, binge, restrict my food or try a new diet (vegan! raw! paleo! ), stress would hit and cravings would start, and I would eventually cave and start eating the white stuff again. There is a better (healthier) way to live. I thought sugar was the problem. If I could just stop eating it, everything would be better. But, the problem wasn’t sugar. I went on a journey of self-care, healing, and discovery. When I stopped believing I was broken, dropped the struggle, and finally let go, I HEALED. I was always searching for the big secret to my health. I thought there was one big mysterious puzzle piece that I had missed to kicking my cravings. And, there was. But, it wasn’t a superfood, a supplement, a modality, or anything like that. It was JOY. Join Megan Buer, CECP and Wendy Vigdor-Hess, RDN as they take you on a journey of healing from the chains of sugar cravings. Join others in a supportive community who have been able to finally break free from emotional eating and the mental battle around sugar. This is a unique opportunity to experience a 2 day taste of the Transforming Your Relationship With Food e-course for FREE. Megan and Wendy incorporate a mind-body approach to food, exploring options beyond the typical deprivation/willpower model. They provide insight into the detrimental effects of sugar on your health and discuss ways to naturally cut out highly addictive foods. This course is designed for people who are already health conscious, but are struggling with breaking the sugar habit. Start Your Journey Today, Click Below! 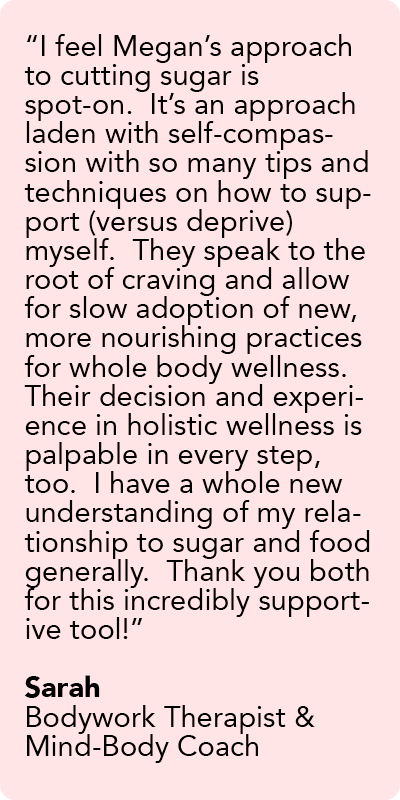 “When I first saw the class called “Transforming Your Relationship with Food”, I thought it would teach me how to never want sugar again. I didn’t think that was possible, nor did I really want it. But, I decided to try anyways because my desire to shovel chocolate chips in my mouth at all hours of the day was getting to be obscene. “I was that person who always thought because I was over-weight that I was inferior. I was addicted to sugar. If I could just cut sugar I could be thin! Turns out it’s not about the sugar. My negative thoughts and internal bullying are what fuel my fire for sugar. Using the tips in Megan and Wendy’s videos and reciting the affirmations have helped me find peace (I also love that I can watch the videos over and over again when I need extra support). Isn't it time to break free from emotional eating, sugar cravings, and diets? Can you image what life would be like if you weren't constantly thinking about food? Craving sugar? Punishing yourself into the next diet? Your life could heal. Your health would transform. You could finally feel deep love and respect for your divine body. You could pursue your passions. Join us on this 2 day journey and see how things start to shift for you. Let's get started!